Vincenzo Catarsi presents the new Calafuria 7, a boat capable of satisfying the most demanding yachtsmen. The boat includes all the qualities that made the Calafuria range famous all over the world. 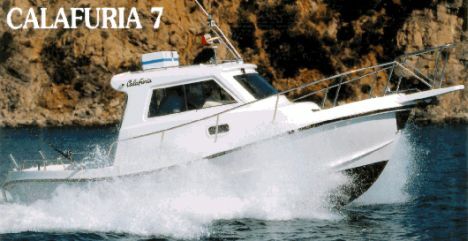 Even though small corrections were made by means of vanguard design techniques, the new "7" maintains the special hull design common to and typical of the Calafuria range. The waterlines were designed to obtain the best compromise between water tightness and speed, comfort and safety. The boat is very stable, even with stern waves. She is quite fast even if without a V-hull. The stability of the boat is excellent, both at high speeds as well as at anchor: even abrupt load variations do not trigger dangerous heeling. Special attention was given to adequate interior arrangement and decoration. As a matter of fact, interior space is ample. Forward there is the classical V-berth with separated toilet. Amidships, there is the dinette with a fully equipped galley and on starboard side there is the helm station. The Calafuria 7 is a boat that doubtlessly attracts deep-sea fishermen, not so much for her performance, as for her strong built and versatility of her deck arrangements. 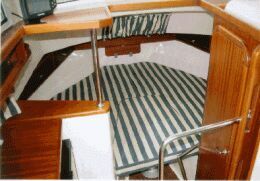 The ample cockpit is fitted with several lockers, a bait well, etc., and it is indeed adequate for any type of fishing. The tested boat, in addition to the double engine throttle levers fitted aft that are very useful for fishermen, the famous "Spingo", the stern drive leg with pneumatic oil transmission and own power was also fitted. Spingo is ideal for trolling and may be also used as an auxiliary propelling unit. Half load displacement: 7505 lbs. Total engines and reduction gears weight: 1,148 lbs. Price with standard equipment and test boat power: Lit. 109,800,000 ex VAT. 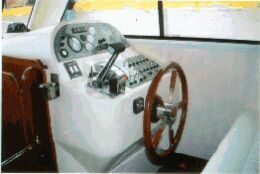 Helm station: steering wheel is to starboard and is fitted with a comfortable settee. Standard equipment includes all engine control instruments and the magnetic compass. Any electronic instrument may be fitted on request. Interiors: forward berth with table fitted with telescopic leg convertible in double V-berth, bathroom is to starboard with marine-type toilet and sink with extending shower. The galley is to port. It is fitted with one sink, two burners and an 11-gallon refrigerator. Deck: easy access to the bow area by means of adequate side decks. The electrical windlass with relative anchor and anchor chain is an optional fitting. The cockpit includes the engine cover, an ample aft locker, several recessed open object holders and three small lockers with fiberglass covers, one of which includes the gas bottle. The aft platform may be fitted with an optional Spingo stern drive leg and swimming ladder.